Can you handle tough interview questions? Have you ever been in an interview and the interviewer asks you an off the wall question to see how you think? Every interview should have these questions and the good ones always do! Interviews are opportunities for the employer to learn about you and demonstrate your skills to convince them you are the right person. How do you prepare for them? Can you prepare for something when you do not know the question or the answer? It is very difficult and maybe impossible. What do you do? I think it is a little like sports, you prepare for all the possibilities and practice. When you play, you are prepared as much as possible and you just react. Hopefully, you react well and catch the ball, make a hit or make the winning play. In this case, ace the interview! A couple years ago, I read some of these questions on the Fortune website that got me thinking. I remember using some of these questions in interviews to see how the candidate thinks. In this economy with nearly 9-10% unemployment, employers are trying to screen out candidates. You can understand that there are hundreds if not thousands of people applying for few openings. To say it is an employer’s market is an understatement! Many companies use telephone interviews to help screen candidates. Telephone interviews are one of the toughest venues! You have to develop a connection over the phone and generally in a couple of minutes or less. It is not easy, but that is what you are facing. At the same time, you may be asked the question of the century to see how you think. What do you do? You prepare and practice! One trick I use is to smile while I talk and never sit down. My voice is friendlier and more authoritative because I am smiling and standing. Pick your time to handle telephone interviews when you are at your best. Never take a morning interview call, if you are better in the afternoon! The questions can range from behavior questions to very specific job questions. What are your strengths or weaknesses? Describe, detail or share a particular situation where you were faced with an issue or problem and demonstrate what you did to overcome or resolve a problem. What are they looking for? They want you to explain your skills and experience. The interviewer will evaluate how good you are at problem solving. Which experience do you want to draw upon to prove your skills? Preparation is necessary for success and your choice should match the skills they are looking for. What is at stake? If you don’t make it passed the first telephone interview, it is over! If you pass this first step, you may have to take a personality, skills or IQ test. Remember, the employer is trying to find the most qualified applicants or screen out all the unqualified candidates. Take your pick, either way you could be eliminated! When and if you make the in person interview, you should expect more of these open-ended questions. When you go for the interview, expect to complete an application and answer questions about what you wrote on the application. Okay, you made it passed the initial screenings and you are in the hot seat. You are ready to answer whatever they will throw at you, but are you? The more real life examples you can bring with you, the more creditable you are. When I interviewed, I had a file folder of my work over the years. It may be a strategic plan, a budget, some analysis or something else. It many ways it is similar to what employees should do when they are reviewed or when you are asking for a raise. You want to show some proof that you are worthy of the raise or in this case demonstrate your skills. 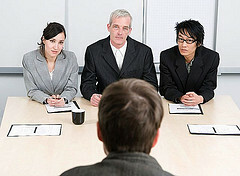 I have had panel interviews, multiple interviews or individual interviews, the questions are different, but similar. They all want to know how you will react, think or solve problems in various situations. If you can show samples of your work, the interviewer reacts differently because it is tangible. It gives you credibility and you can discuss your skills on something you are familiar with. This is my kind of interview because I have control. Don’t forget to have some questions for the interviewer to clinch the deal! Interviews have become an obstacle course! The employer is trying to find the very best in a field of hundreds or thousands of candidates. It is not fair, but is just the way it is! They get to ask any question in the book and you have to respond well. The best way to handle these questions is to prepare and practice a lot. Imagine getting questions such as: “Does life fascinate you?” “Just entertain me for 5 minutes, I‘m not going to talk” “How would you cure world hunger?” Can you handle tough interview questions? Ugh interviews. The question “just entertain me for a few minutes” could be a tough one. Manager-tools has some great material about preparing for an interview. I found that if you really put a lot of effort into your resume – that alone helps enormously to frame responses in a way that shows you are the best candidate for the job. Resumes get you in the door and yes frame your skills. Most employers use questions about your resume to see how you think and fit witheir group, team or company. The new tough questions are intended to separate the best from the rest. It is very competitive at some companies.